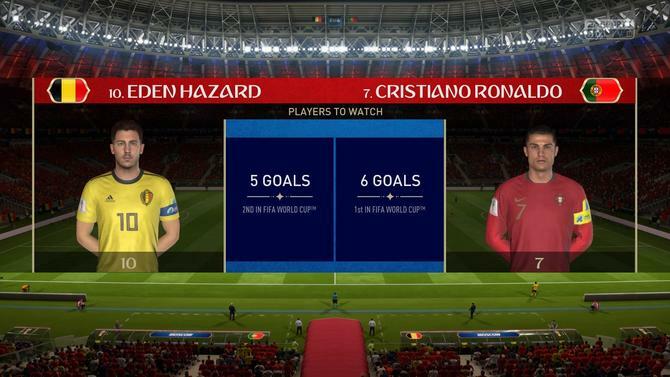 The 2018 FIFA World Cup is not too far away, and on Tuesday the folks over at EA Sports blessed us all with a World Cup-themed downloadable update to "FIFA 18" with all the stadiums, teams, badges, uniforms, players and much more. Be sure to download the update if you own the game. With that being said, this is the perfect time to test the game's simulator and see who comes out on top. 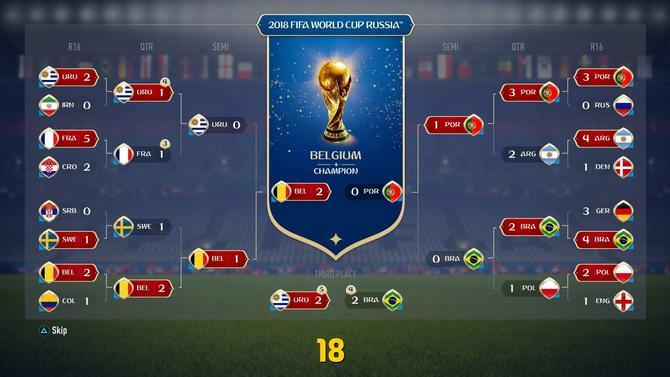 The 2018 FIFA World Cup is not too far away, and on Tuesday the folks over at EA Sports blessed us all with a World Cup-themed downloadable update to “FIFA 18” with all the stadiums, teams, badges, uniforms, players and much more. Be sure to download the update if you own the game. With that being said, this is the perfect time to test the game’s simulator and see who comes out on top. Group A winner: Uruguay (9 points, plus-5 goal differential). Wins over Egypt (2-0), Saudi Arabia (3-1) and Russia (2-1). Uruguay defender Diego Godin was ruled out of action for seven days with a groin strain in the group stage. Group A runner-up: Russia (6 points, plus-4 goal differential). Wins over Saudi Arabia (4-0) and Egypt (2-1) before losing 2-1 to Uruguay on the final matchday of the group stage. Group B winner: Portugal (7 points, plus-4 goal differential). Ronaldo and Co. were held to a draw against Spain in the opening game before beating Morocco and Iran by the same 2-0 scoreline. Ronnie finished the group stage with three goals, tied with three other players atop the leaderboard. Group B runner-up: Iran (4 points, negative-1 goal differential). Iran managed to squeak by with a 1-0 win over Morocco, a 1-1 draw against heavyweights Spain and a 2-0 loss to group stage winners Portugal. Spain finished with three points and crashed out after drawing with all three group stage opponents, but that didn’t stop Isco from scoring the goal of the tournament. Group C winner: France (9 points, plus-5 goal differential). Les Bleus picked up wins against Australia (2-0), Peru (2-0) and Denmark (1-0). Group C runner-up: Denmark (4 points, plus-1 goal differential). Despite drawing to Peru (1-1) and losing to group stage favorites France (1-0), a 3-1 win over the Aussies was enough to move the Danish side to the knockout stage over Peru, which finished third. Group D winner: Argentina (7 points, plus-4 goal differential). Despite drawing to Croatia in a game where Messi scored a fantastic goal on a tornado-like skill move you would only see in video games, Argentina picked win over Iceland (3-0) and Nigeria (1-0) to advance as group stage winners. Messi and Angel Di Maria came away with two goals in the opening round. Group D runner-up: Croatia (4 points, zero goal differential). Croatia held strong against Argentina, securing a 2-2 draw which proved to be the difference between second and third in the group stage. Iceland finished with four points but had a negative-1 goal goal differential. Advantage goes to Croatia. Group E winner: Serbia (5 points, plus-1 goal differential). Surprise! Just when we all thought Brazil would easily take care of this group, the Serbian national team pulled off one of the upsets of the tournament by knocking off the Canarinhos, 1-0, on the final matchday of the group. Serbia had 1-1 draws against Costa Rica and Switzerland before that miraculous effort in Game 3. Group E runner-up: Brazil (4 points, plus-4 goal differential). The Brazilians had a topsy-turvy group stage, with a scoreless draw to Switzerland, a 5-0 rout over Costa Rica and a shock defeat to Serbia. Neymar failed to find the back of the net. Their prize? A matchup against reigning champs Germany in the round of 16. Group F winner: Germany (9 points, plus-7 goal differential). It was picture-perfect for the four-time champs in the group stage with wins over Mexico (2-0), Sweden (3-0) and South Korea (3-1). Group F runner-up: Sweden (3 points, negative-2 goal differential). The Mexicans were knocked out despite finishing with the same points and goal differential as Sweden, which lost to Mexico on the final matchday but finished with four goals scored and six goals allowed, which was enough to break the tie and send them as the runner-up of the group. Group G runner-up: England (4 points, plus-2 goal differential). A shock scoreless draw against Tunisia and a 1-0 loss to Belgium nearly kept England out of the knockout stage for the second consecutive World Cup. A 3-0 win over Panama in between those two poor results kept them afloat. Group H winner: Poland (9 points, plus-7 goal differential). Poland made easy work of Senegal with a 4-0 win on the opening matchday before squeaking by the Cafeteros 2-1 and topping Japan 2-0 on the final matchday. The Polish defense allowed only one goal throughout the group stage. Group H runner-up: Colombia (4 points, zero goal differential). James Rodriguez and Co. stumbled out of the gates with a 1-1 draw to Japan and a 2-1 loss to Poland. A 2-1 win over Senegal was enough to catapult them back into second place and onto the round of 16. Uruguay made easy work of Iran thanks to an early goal from PSG forward Edinson Cavani. Cristian Rodriguez earned Man of the Match honors. On a sour note, center back Sebastian Coates suffered a broken metatarsal bone during the game, which kept him sidelined for five weeks and the remainder of the tournament. Uruguay advanced to play France in the quarters. Arguably one of the wildest games of the tournament. Kylian Mbappe and Paul Pogba gave the French team a two-goal cushion before Andrej Kamaric scored just before halftime and Mario Mandzukic equalized it 12 minutes after the break to force the match to extra time. Les Bleus kicked it into overdrive in the extra period, scoring three goals. Mbappe netted a brace and earned Man of the Match honors. Emil Forsberg missed a penalty in the 37th minute and both sides were held scoreless for the first 78 minutes before Forsberg himself broke the deadlock to send the Swedes to the last eight. I’m sure somewhere out there Zlatan Ibrahimovic is watching with a smile from ear to ear. Dries Mertens suffered a torn ACL injury in the 34th minute was subbed by Michy Batshuayi. Eden Hazard took advantage of a blunder by Colombian goalkeeper David Ospina to give the Belgian side the lead in the 41st minute. The Chelsea star added a second in the 68th minute to put the game away. Falcao added a consolation goal for Los Cafeteros in the 73rd minute. Up next for the Red Devils is a matchup against Sweden. Ronaldo got the party started for the Portuguese side with an early goal from the penalty spot to build a comfortable lead. Andre Silva extended the lead 11 minutes after the halftime break and Danilo Pereira sent the hosts packing for good with a goal 12 minutes before the final whistle. Ronnie was awarded Man of the Match. It was a quiet night for Messi. Denmark controlled possession 59 to 41 percent and outshot Argentina 10 to 9, but Messi’s supporting cast made the best out of their opportunities. Christian Eriksen put the underdogs ahead in the 18th minute before the Argentinians rallied to score four, including three in the second half. Sergio Aguero, who earned the start over Gonzalo Higuain, scored in the 63rd minute and earned Man of the Match honors. Up next for Argentina is a showdown against Portugal in the quarterfinal. This match did not have shades of 7-1, but both sides combined for seven goals and it was certainly an instant classic. Miranda got the Brazilians on board with a nice header on a corner kick, but Germany responded with goals from Timo Werner in the 34th minute and Mesut Ozil in the 53rd. Neymar knotted things up before Werner added a second to give the Germans a 3-2 lead. Philippe Coutinho scored a wonder goal from long distance with 20 minutes remaining to keep the Brazilians alive and Gabriel Jesus scored the goofiest goal you’ll ever see, capitalizing off a pinball of deflections inside the box and Manuel Neuer out of place to secure a 4-3 win for the Selecao. Dele Alli found an early goal but it wasn’t enough for the Three Lions in the round of 16. Poland’s top scorer, Rober Lewandowski reached the back of the net six minutes before the halftime break and in dramatic fashion, Maciej Rybus netted the winner in the 89th minute to advance to the quarterfinal round where the Polish side met the Brazilians. The resilient Uruguay squad knocked off one of the favorites to win the tournament. Mbappe scored in the 22nd minute to give the French side a 1-0 halftime lead. A minute after the break, Cavani broke through and found the equalizer to force the game into extra time and eventually into penalty shootouts where the South American side converted four spot kicks to advance to the semis. On a sour note, Rodrigo Bentancur suffered a broken tibia and was ruled out for the remainder of the tourney. Another game, another thriller. This one was decided after 90 minutes of play after Romelu Lukaku and the Red Devils drew the first blood in the 25th minute before defensive midfielder Jakob Johansson scored in the 58th minute to force extra time. Lukaku netted a brace late in the second period of extra time to send his side into the semifinal round for a showdown against Uruguay. It’s Messi vs. Ronaldo. It’s the matchup everyone had been craving. It was the first time these two met in the World Cup and the matchup did not disappoint. Argentina built a two-goal cushion thanks to goals from Ramiro Funes Mori and Angel Di Maria before Joao Mario cut the deficit in half just before the halftime break. Andre Silva found the equalizer in the 62nd minute and Ronaldo scored the winner in the 86th minute. It had to be Ronaldo, eh? And for Messi, it was another disappointing exit, and possibly the end of his days playing in the World Cup. He’ll be 34 by the time the Qatar World Cup rolls around in 2022. After exorcising the ghosts of 7-1 in the previous round, Tite’s squad relied on the defenders to keep Brazil going. Danilo converted a loose rebound outside of the box in the opening 60 seconds of the match to give the five-time champs an extremely early lead. Miranda headed home another goal from a corner to put the game away. Polish winger Kamil Grosicki netted a consolation goal five minutes before the final whistle. Eden Hazard led the team in goals scored with five this tournament, but it was his sibling Thorgan that scored a curler in the second half to put the Red Devils in their first World Cup final. Another World Cup, another appearance in the third-place game for Brazil. After falling short against Portugal, the Brazilians needed a pair of equalizers to stay alive and force penalty kicks against the South American rivals. After Luis Suarez scored in the 37th minute, Neymar knotted things up 10 minutes after the halftime break to force extra time. Rodriguez scored seven minutes in and Gabriel Jesus scored at the death. Uruguay converted all five of its spot-kick attempts to clinch third place. So to catch up on everything, here’s the complete bracket with all of the results in the knockout stage. Although Thorgen Hazard stole the show in the semis and final, it was his older brother Eden that took home the Golden Ball Award with five goals scored and five assists. Ronaldo was awarded the Golden Boot as the tournament’s top scorer with six goals. For what it’s worth, his rivals Messi and Neymar finished the competition with two and three goals, respectively.